Born in Purisima del Rincon, a small town near Leon, Guanajuato. 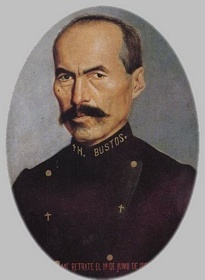 During his life he worked many odd jobs such as picking fruit, carpentry, painting and sculpture, but it was his unparalleled ability to make retablos and exvotos which would make him one of the best Mexican artists of the turn of the Century. Little is known about his formal education, although his great skill makes evident that he did receive at least some academic training. It is thought that he may have been a disciple of Juan N. Herrera and/or Jose J. Montiel. As an artist, he started working in portraiture and became quite skilled and sought after for it. He worked with modest materials, primarily using tin sheets as support for his masterpieces since his commissioners were also of modest means. Early work usually consisted of just the upper body, while in later years he started making full figure painting, and incorporated more than just one figure to his art. Even if it's true that he can be criticized about his use of anatomic perspective, it's his handling of facial features and expressions that give his work such an amazing character. Aside from portraits, he also made still lifes and religious painting. He decorated the church of the Purisima in his home town with images from the Passion of Christ. He died in the same little town where he was born, the same place he lived and where he had worked all of his life in 1907.